I have moved to my new house and made an appointment for installation. The service came earlier than the agreed time before I arrive and made the installation. My wife has approved the installation because Wi-Fi has been working. However there are integrated ethernet cables which are routed to upper floors inside the cabinet. Their end connections are not done so I can not connect them to the modem. When I come home I saw the missing issue and called Guidion immediately to call the same service back to my house just on the way and fix it too. However they asked me to contact T-mobile and make an other appointment again. So I request to have an appointment to do the below the missing item which was not finalized. "Meegeleverde UTP- en telefoniebekabeling op of langs de plint wegleggen met spijkerclips (max. 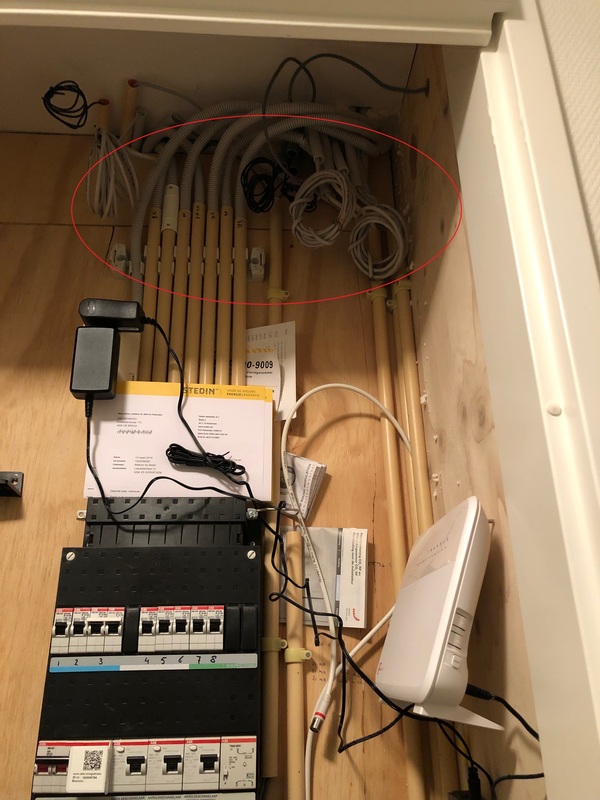 15 meter)"
You can translate this yourself, but it should not be interpreted as fixing existing cabling in customer's house for free. It also does not say that the mechanic should put cables through concrete ceilings or walls. From the picture I cannot see if there is an ethernetcable between the mediaconvertor (the darkgray thing just off-picture below the router) and the T-Mobile router. So do you have a working internet connection or not? The max 15 meter refers to a (possible) connection between router and a PC AFAIK. making the connectors on existing wirres is not part of the installation. you can make an appointment with Guidion for that. I have a working internet connection with wireless. However with ethernet plugs at upper floor, I can not connect my PC directly because the end connections to the modem are not done. Please see attached picture. No It is not finalized. 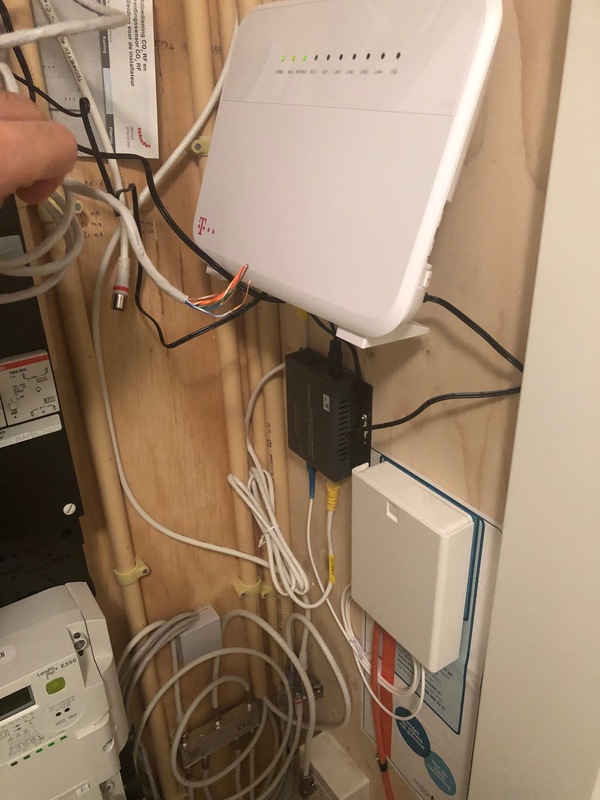 The cable is routed through wall so they need to connect my PC to modem via cable by fixing that shown end connection and I will not pay for it. so first the installation is completd and signd for, and after the visit it is not completed. Meegeleverde UTP- en telefoniebekabeling op of langs de plint wegleggen met spijkerclips (max. 15 meter)" only the 15m cable from the installation package is installed. basicly your request is not whitin the installation to begin with. so if you need it fixxed it is at your own cost. First of all welcome to T-Mobile Thuis! Like @tmoesel and @Hidden.nld have explained correctly. The engineer doesn't fix the existing cables according to the basic installation. He connects the 15 meter cable that you've received in the installation box. When it's not possible due different factors, then he or she only installs the Wifi connection. If you want extra installation (fixing the existing cables) then you could contact Guidion and inform about the extra costs.